The negotiation between CiU and ERC in order to get to an agreement that ensures the governability of the country as well as the celebration of an independence referendum during the next legislative session has begun. 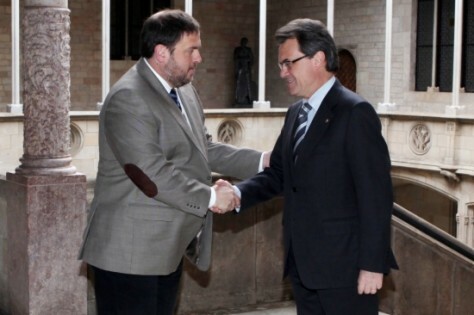 Today Artur Mas and Oriol Junqueras had lunch together at the Palau (Catalan government building) and in a cordial setting, they exchanged impressions: Mas wants the Republicans to form part of the government, and the president of the Republican Left has announced that they will not do so, but that they are committed to guaranteeing the government's stability in four key areas: the investiture of the president, the budget, foreign affairs, and the independence referendum. The Republicans don't want to form part of the government but they have committed themselves to guaranteeing its stability from the outside. Junqueras says that he is convinced that he has correctly interpreted the will expressed at the polls, according to statements he made today to Catalunya Ràdio. In exchange, ERC wants assurances that the independence referendum will continue forward and that the budget cuts be softened. The Republicans are aware of the fact that even if they don't form part of the government, if they want to offer stability to CiU's government, they will have to accept that some additional budget cuts will have to be made. Yesterday, government spokesperson Francesc Homs warned that similar budget cuts will be necessary in 2013 as there were in 2011 and 2012. But ERC aims to soften the austerity plan, and to implement changes in fiscal policy with measures like the reversal of the 1 euro per prescription drug plan, or the reinstatement of the inheritance tax on the highest brackets. Today, then, Mas and Junqueras inaugurated the negotiations, and put their cards on the table. And according to sources close to the conversation, they are preparing to delve deeper into the negotiations, with the participation of a team of economists who will be studying budget-related matters as well as a team of judicial experts who will analyze the steps necessary so that the people of Catalonia can be consulted on independence. ERC (Esquerra Republicana de Catalunya, Republican Left, and often referred to as the Republicans, but in the sense of Republic, not GOP) is the traditional centre-left independentist party in Catalonia. They won 21 seats (up from 10) in the Catalan Parliament on November 25th, and were the second most voted party. Their leader is Oriol Junqueras. CiU (Convergència i Unió, Convergence and Union) is a centre-right coalition of CDC (social democrats) and UDC (Christian democrats), who won 50 seats in the Catalan Parliament, (down from 62) and thus are the most voted party. Their leader is Artur Mas, who will be the President of the new parliament. I drove down to New York yesterday to watch the Catalan election returns with more than 100 Catalan expats in the Socarrat paella bar. The croquetas were delicious, if a bit expensive. The first reactions were incredulity, combined with sadness. As the night wore on, the results improved, and so did the mood. But it certainly wasn't the jubilant party that some (yes me!) had hoped for. So what happened? And perhaps first, what were they voting for? The Catalan President Artur Mas had called early elections after three important events: the massively attended march for Catalan Independence on September 11th, the definitive "no" received from Spanish President Rajoy shortly thereafter to an improved financial deal for Catalonia, and the lingering effects of the "whittling away" of Catalonia's 2nd Statute of Autonomy, at the hands of the rightist, unionist PP, despite it having duly passed by referendum, in the Catalan Parliament, and even in the Spanish Parliament. Mas didn't have to call elections. But, and this is very important, he knew that the international community (or Spain) would never accept a push for independence from a party that had run on a platform that didn't include independence. The fact that Mas called early elections, despite the risk, shows that he was putting the legitimacy of independence ahead of his party's security. This should not be overlooked. And although I was frustrated by Mas’ vocabulary—he steadfastly refused to use the word independence—I was impressed with the democracy reflected in his speeches, and for the clear awareness that there is no future for Catalonia within Spain, that Catalonia must have its own state. But CiU is a complicated coalition. They have been the majority force in Catalonia almost since the transition to democracy, and many saw their recent conversion as politically motivated. They said derisively that Mas was following the people, riding the wave, which frankly, I'm not so sure is such a bad thing. However, the disastrous decision to show the president in a Moses-like pose on the campaign posters played right into the hands of those who claimed the new-found independentism was just a front to solidfy Mas' personal power. At the same time, CiU's coalition refused to jettison the extremely divisive Josep Antoni Duran i Lleida, who constantly and pointedly reminded anxious voters that he believed Catalonia didn't make sense without Spain, or Spain without Catalonia and that CiU's platform did not include the word "independence". Duran completely torpedoed Mas' credibility and should be held accountable for much of CiU's failure to convince voters of their desire for “their own state” or however they wanted to word it. CiU paid dearly for these mistakes. From 62 seats, they fell to 50. (No poll had predicted such results, hence the incredulity. They need Nate Silver badly.) But 50 seats is still 2.5 times as many as the 2nd power, and more than all the unionist parties combined. All is not lost. 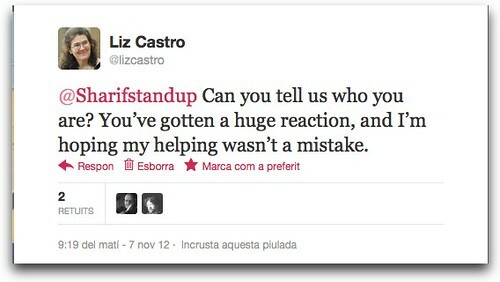 Let's talk about that second power: ERC, the “Republican Left”. Republican in the sense of a Catalan Republic, not Mitt Romney! This is the traditional independentist party, the same party that declared the Catalan Republic in 1931, and whose democratically elected president was handed over by Franco to the Nazis, who promptly executed him. But it is also the ERC who lost huge amounts of credibility and political capital during the seven years that they put independence aside in an effort to advance a more leftist social program together with the Socialists and Greens. This so called "tripartit" or "threeparty" put Socialists in the Presidency of the Catalan Government (Generalitat) for the first time since the transition, and ERC bet on gaining prestige and experience in office, rather than furthering independence. Unfortunately for them, the Catalan Socialists were wed (or chained, depending on how you look at it) to the very centralist Spanish Socialists, and the Greens have always been more interested in social policy than independence, stubbornly refusing to see how the latter determines the former. The terrible ruling of Spain's Constitutional Court, in which the new Catalan Statute of Autonomy was further destroyed, was evidence that ERC's bet had failed miserably, evidenced by their electoral results in 2006 and 2010. So CiU returned to power in 2010 on a platform of fiscal discipline at home and fiscal pact with Madrid. They found the coffers empty and no one willing to take the blame, certainly not the Catalan Left coalition of Socialists, Greens and ERC. And then, thanks to pressure from the banking crisis and Brussels, the Spanish President began to turn the screws, refusing to deliver billions of dollars in funds already budgeted to Catalonia. CiU, whose economic policies are much closer to the Spanish President's PP party than to that of the Catalan left, may have been surprised to find that the PP had left them high and dry. CiU for many years has secured crumbs from the Spanish table thanks to its alliances with the PP. Now that the table was more bare, the PP turned its back on CiU, preferring to spend its decreasing funds elsewhere, for example in Andalusia and Galicia. So CiU bet on the “fiscal pact”: a demand that Spain fix the desperately unfair system of taxation in which Catalonia transfers almost 9% of its GDP to fund toll-free rolls, high speed trains, and brand new hospitals and schools in Spain, while going without at home. (That 9%, or some 20 billion US dollars, are above and beyond what Catalans pay in taxes and get back in services and infrastructure.) At the same time, CiU pledged to clean up the fiscal situation, by implementing the budget cuts demanded by the central government. An almost impossible combination, which was not helped by the fact that any concessions that Spain's PP had extracted from Brussels were not shared with Catalonia, adding to CiU's frustration with its former partner. The Greens and Socialists pounced, blaming CiU for unraveling the social safety net. I was particularly perplexed when at the end of 2011, and Spain had reneged on delivering already-budgeted funds to Catalonia, thus forcing CiU to delay payments and make further cuts, that the left's criticism was not to Spain but to CiU. In my opinion, they took political potshots instead of responsibility. After the massive September 11th march, and Rajoy's definitive "no" to the fiscal pact, Mas chose sovereignty. He didn't have to, and I think deserves some credit for doing so. And Esquerra (ERC), to their credit, has been fair. While they have demanded improved social policy and more prioritized budget cuts, they have not attacked Mas personally. And they were rewarded in the polls, rising to 21 seats, and the second force in the Parliament. Much of their rise is thanks to Oriol Junqueras, their new leader, who is intelligent, focused, and willing to negotiate. The rest of the results were for me, less hopeful, or more ambiguous. I expected the Catalan Socialists, who campaigned on the impossible platform of “federalism”—rejected even by their own Spanish Socialist partners, to fall farther than the 8 seats they lost (to 20). The Catalan wing of the People's Party, the same rightist party in power in Madrid gained one seat, and Ciutadans, a pro-unionist party gained six, thanks to its vicious fear campaign: they scurrilously claimed that an independent Catalonia would require people to Catalanize their names, that university degrees would no longer be recognized, and probably most damaging: that Catalonia would be "expelled" from Europe, as if that were even possible. The Catalan Greens gained three, capitalizing on people's continued mistrust of CiU on independence, and especially over anger over budget cuts. And they blamed CiU for the police violence that occurred during the general strike on November 14, right in the middle of the electoral period. It frustrates me that they took no responsibility for their own role in financial woes, and that their attacks on Mas have been so personal and so virulent. The leader of the Greens, Joan Herrera, feels more opportunist to me than any other party leader. And finally, a new party has emerged, and another has disappeared. The CUP, which is a grassroots, leftist and pro-independence movement (not party) won 3 seats, while Solidaritat, a purely pro-independence party, lost their three. I don't know the first group well enough to talk about them. I will miss Solidarity's focus and dedication, if not their sharp tongues. In the end, I think that instead of focusing on CiU's decline, we should recognize independence's rise. In the previous parliament, there were 14 MP's who were on the record in favor of independence. In the new Parliament, there are 74, not counting an additional 20 or so MPs from the Greens and Socialists who are at least in favor of the right to self-determination. President Mas has said he will forge ahead with the referendum for Catalan independence, and Oriol Junqueras, has repeatedly said he would support Mas in such an endeavor. Junqueras' role will be crucial and complicated, as ERC and CiU are now wholly dependent on each other, for both independence and sound fiscal policy. The intelligence and attitude of both leaders gives me hope they will find a way on both issues. Thanks so much to all who read my previous post about Sharif's video, and my musings on whether or not it was real, and whether it mattered if it was or not. The first video is an introduction to the project, explaining who I am and what I'm hoping to achieve. 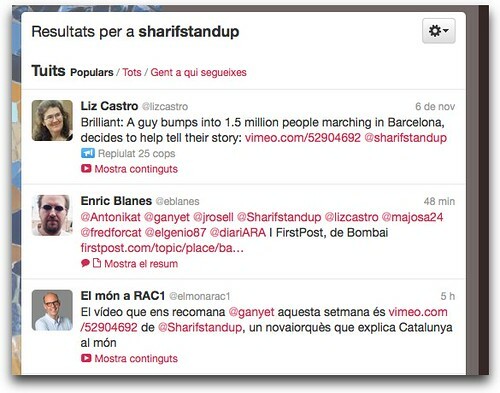 I purposely did it in a homegrown sort of way: I am not a journalist, but rather a computer book writer with a lot of experience in Catalonia. My opinions and observations are personal, though they're based on years of living and traveling in Catalonia. My hope is that by knowing who I am, you'll be able to judge my videos for yourself. The second video has the same style that I'm hoping to use for future videos: I speak about a current issue happening in Catalonia—in this case, it's the premiere of the movie, Fènix 11*23—and I explain it to an American audience, but with more background and explanation than Americans usually get here. I don't know if any Americans will be interested. I said before that it's not that we Americans don't care what's going on beyond our borders, it's just that we have enough to think about right here inside. But if you want to share my videos, well, maybe we'll catch their attention. I am totally open to ideas for future videos and also to corrections to my Catalan, which I hope is understandable, but which I suspect may have more than a few mistakes. You can contact me through this blog, or via Twitter.